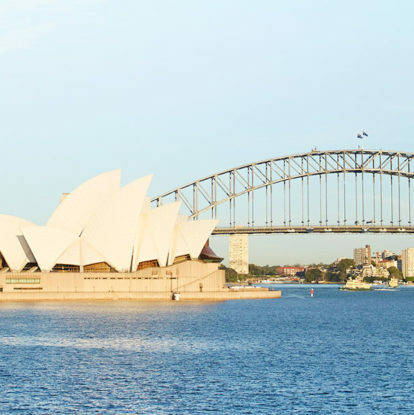 While Sydney’s headlining sights are an undeniable drawcard, its delights can equally be found in its dynamic and diverse neighborhoods and suburbs. I was on a mission. In the heart of Sydney’s crowded city center, I ducked down a nondescript laneway, across an abandoned courtyard and down an empty fire escape where, at the bottom of some fluorescent-lit concrete stairs, an unmarked doorway stood next to a couple of kegs of beer. It could not have been a less promising sight. But the moment I cracked the portal, music and laughter exploded all around me. I had found the entrance to a dimly lit whisky cellar called Baxter Inn, the hedonistic Sydney version of a Prohibition speakeasy. At 4pm, dapper revelers already packed the elegant wooden bar, which had a gorgeously backlit wall of spirit bottles reaching to the ceiling. Bartenders wearing black ties and white shorts as if they were at the beach clambered for the higher-up bottles on a rolling library ladder, while tutti-frutti tropical cocktails with names like Morning Glory Murder and Penicillin slid across the tables. As I settled onto a bar stool and ordered a single malt called Limeburners – yes, there are whisky distillers Down Under, joining the now-famous wine producers – I congratulated myself on adding another stop on my “greatest hits” tour of Sydney. I’ve been coming back to my home city at least once a year since I moved to New York, and each time I set myself a personal project: while I am addicted to the famous attractions, I also like to find something new at every site. Since the city changes at breakneck speed, novel bars, restaurants and cafes – even parks – are always hitting me with surprises. On my recent three-day visit, I once again set myself the heroic task of expanding on the Sydney classics. Even as the jet was banking over its scalloped coast, I was reminded what a stroke of luck it is for travelers that most international flights come and go through here. Australia’s largest city (not the capital – that’s Canberra) is the perfect place to get your bearings and recover from jet-lag; it’s one of the world’s great outdoor cities, as inseparable from the ocean as Honolulu or Rio de Janeiro, with great swathes of pristine bushland and gold-sand beaches open for the taking. First off – and there is nothing original in this – I rushed to the Harbour; I don’t feel as if I’ve really arrived in Sydney until I have seen its sparkling waters. This time, I dropped my bags from the airport and hopped in a cab to a waterfront district called Woolloomooloo (the most memorable of Sydney’s many resonant Indigenous names) and its Finger Wharf, a cathedral-like wooden dock that once housed enormous bales of wool for export but now contains strings of glamorous restaurants, the arty Ovolo Hotel and luxury apartments (actor Russell Crowe lives there). Its latest exotic addition, I noted, is an experimental ‘plant-based’ restaurant called Alibi, where you can try chilled kelp noodle spaghetti in almond sauce, pulled mushroom tacos or “cashew-based cheeses”. From there, it was a short hike up a hill to the Art Gallery of New South Wales, which looms like a Greek temple over trimmed lawns where ibis birds parade amongst the cafe tables. Unlike US museums, it’s entirely free. One of my favorite rituals in Sydney is to pop inside for an hour or so to enjoy a few classic Australian works at random. I stumbled onto an untitled dot painting from 1992 by the brilliant Indigenous artist Emily Kame Kngwarreye, described by one contemporary admirer as “the greatest artist of the last 40,000 years,” and Australian Beach Pattern, by Charles Meere (1940), now my favorite mock-heroic vision of the sun-worshipping Aussie lifestyle. a sandstone headland with a bench carved by convicts 200 years ago for a British governor’s wife to admire the view. The panorama is one of the most expansive in Sydney. As for me, I took a more comfortable lawn chair at a pop-up cafe called Busby’s. This is also the idyllic setting for the St. George OpenAir cinema in summer (January 8 to February 16) and Handa Opera in fall (March 22 to April 21), when the Australian Opera performs on a stage on the water. I was drawn like a magnet to the Sydney Opera House and its pearly white shells gleaming in the sun. Like an enormous art installation, the Sydney icon looks different from every angle and changes every hour of the day; booking a table at Bennelong restaurant inside the sails is a must-do, both for the thrill of sitting inside this icon, and for the chance to sample celebrated chef Peter Gilmore’s menu. Strolling from the Opera House, past Opera Bar, where the weekend breakfast menu comes with the best view in town of the Sydney Harbour Bridge (or “The Coathanger” as locals call it), I arrived at the Museum of Contemporary Art (MCA), whose rooftop Sculpture Terrace – yes, more sweeping views – has a music series with Australia’s best indie-rock bands. The next stretch of my walk summed up the history of Sydney within a few hundred yards. At the front door of the MCA starts the Rocks, whose narrow laneways were carved by convict chain gangs in the 18th century. Sydney was famously founded in 1788 as a dumping ground for prisoners from the slums of London, but transformed itself within a few decades to one of the busiest ports in the British Empire. At lovely Millers Point, once an enclave for dock workers when the Harbour was as dense with water traffic as Brooklyn, the area’s most atmospheric old pub, Hotel Palisade, now has a stunning rooftop bar, as well as delightful rooms rendered by Sydney interior designer Sibella Court. Barangaroo is Sydney’s newest (and most impressive) dining precinct – and is definitely worth a look. I finished the day squarely back in the 21st century: at Barangaroo, a newly landscaped reserve, reclaimed from the old industrial shoreline, that spills down to a showcase of postmodern architecture, including buildings that look like flying saucers and towers gleaming like daggers. Spoiled for choice by the restaurants on offer, I opted for Banksii Vermouth Bar and Bistro, which is named after the first British naturalist to land in Australia 220 years ago, Sir Joseph Banks. I would have been just as content to end up at nearby Barangaroo House, three stories of eating and drinking overseen by another renowned Sydney chef, Matt Moran, with a casual bar and eatery at ground level, the fine dining Bea on level two, and Smoke bar crowning the rooftop. The Bondi-to-Bronte coastal walk is a favorite for both those wanting to appreciate the scenery and the fitness-focused. Day two was a complete change of Sydney scenery, trading the placid Harbour for the roaring Pacific. A short cab ride took me to Bronte Beach, the start of the dramatic Bronte to Bondi coastal walk. For the next half hour, I followed a path over sandstone headlands, each one carved by millennia of sea wind into abstract sculptures. The climax comes when you turn a corner and glorious Bondi Beach unfurls below; it’s hard not to gasp at Sydney’s most gorgeous arc of sand, the antipodean answer to Waikiki and Copacabana, with its Art Deco apartment buildings facing the surf and the Pacific Ocean beyond. If you dine at Icebergs, you’ll overlook the iconic pool below. By the time I got to the northern end, I was ready for breakfast with the surfers at Speedos cafe, a beloved Bondi institution. Once, fish and chips qualified as haute cuisine here, but the beach is now one of the city’s most happening restaurant scenes, and whole days can be spent jumping from ocean dips to a different table and back again. After clambering around the northern headland to jump off the rocks, I headed back to the spanking new Pacific Club. It has the dreamy vibe of old Bondi with polished wood and marble decor, but an avant-garde menu – I ordered a plate full of enormous torched Ballina prawns with kelp butter and pickled sea lettuce. But Sydney is more than just hypnotic water views and gorging on seafood – the most exciting cultural action is in the “inner city,” in the once-gritty neighborhoods of Victorian terrace houses and industrial spaces with oddly quaint English names like Potts Point, Kings Cross, Glebe, Paddington. From Bills, I hopped in a cab to a trio of quirky artistic outposts: the White Rabbit in Chippendale, one of the world’s most provocative collections of Chinese contemporary art; the Brett Whiteley Studio in Surry Hills, the intimate workspace of Australia’s most renowned artist of the late 20th century, who captured Sydney’s brilliant light and vermilion blues before his untimely death in 1992; and CarriageWorks, a former rail yard warehouse in Redfern that has been converted into cavernous galleries. Carriageworks is only one of the many renovations of neglected architectural sites of late in Sydney, which is adding new layers to the inner city. For another dose, I popped in for a cocktail at the Old Clare in Chippendale; the classic Art Deco pub, attached to a once-derelict brewery, is filled with elegant retro furniture and marvelous Depression-era beer ads on the polished tile walls. On a whim, I took a seat at the complex’s new restaurant, Automata, whose sleek minimalist decor belies the delirious inventiveness of its award-winning food. I needed a dictionary to understand the menu, settling on kangaroo carpaccio with koji cream and glazed wakame, followed by hapuku and sea blite; only later did I learn that Automata is ranked as one of Australia’s top 100 eateries. The incredible interior of Spice Alley in Chippendale. Back out on the street, I assumed I had unearthed all the new “greatest hits” I was going to find, but a sign painted on the wall of a nearby historic terrace grabbed my attention: Spice Alley. Rounding the corner I discovered an outdoor dining room rimmed with Asian eateries and strung with lanterns; it seems that in Sydney, that particular mission is never accomplished. For more on Sydney, read our Ultimate Sydney city guide.